Jan 01, 2006. Small update. Hello,I am Samuel L Flyinghorse. I haven't updated this Site since Feb 2005. I'm out of space on the server for pictures. I'll let this stay as is. I have a BLOG that I update Monthly. You'll find the Link on page 2 of this site. I once served in a small Native Alaskan Village as a VPSO. 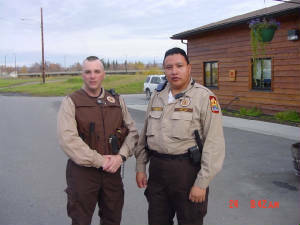 The top photo is me with Officer Stotts in Fairbanks in 2002. It was an honor to serve with Stotts and the other fine officers in the Fairbanks region. 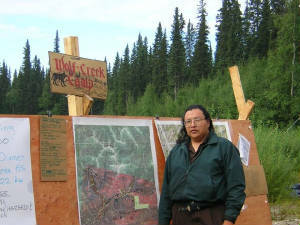 The other photo (taken later)is when I worked as an EFF-Emergency Fire Fighter with the Tok Crew "Regulators" at the Wolf Creek fire near the Chena Hot Springs Resort NE of Fairbanks in July 2004. I always wanted to experience EFF work and now I have. You'll need to take a class from Forestry Division and get issued a "Red Card" to qualify to work as EFF. Then call around to Forestry and be ready to go that Hour, better yet; show up, camp out and be ready for work. Take a small tent, buy good fitting All Leather Work boots and take plenty of thick socks and undies to last 21 days. Take Nothing else, You'll get issued what you need. From Dec 2002 until Dec 2004 I grew my hair out. It went past my shoulders. 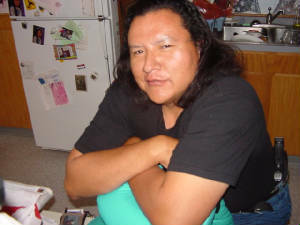 I fit the image of a handsome Lakota man. I trimmed it myself and kept it neat and clean. Here is a picture of me sitting at my computer, resting on my Massage chair. I once worked as a Licensed Cosmetologist and as a Licensed Massage Practitioner in WA state. Building trust with people and developing relationships are learned skills, such activities will do you no good unless you have Other People's interests in mind. You have to be honest when getting into someone's head, life and heart. "Intuition" about people from my experiences working Behind the Salon Chair and Beside the Massage Table & Massage Chair. I was a good Stylist and an Excellent Therapist!!! Such gifts have benefitted me in my endeavors up here in Alaska when dealing with people in my current roles of Public Safety. Trust means so much to me. And so does the joy from having good friends in my life Near and Far. I am a Latter Day Saint (LDS/Mormon) and have been on the LDS ISPP (Indian Student Placement Program) for 6 years. I have also served a 2 year Church mission to CVBC (Canada Vancouver, British Columbia). I have been seeking out other LDS IPP students / participants. Looking back on my own life and experiences with the IPP, I consider myself a success story in regards to this LDSISPP. Though I tried to get married after my Church mission and have a family of my own, and settle into "Mormon" life; these things never happened. The more I went to Church and to the Temple, and the more service I gave the more my life fell apart. I was rejected by some Church members, by my fiance, by some other friends and I left my business efforts of Hair & Massage in the Seattle area. It was disheartening to suffer so much for being true to my faith, in trying to move on in my life and to better myself as directed by Church teachings, by my own Patriarchal blessing, and from other Church & Priesthood blessings given to me throughout my life. After living a few years in homelessness and in day jobs / temp labor in Seattle my mother sent a plane ticket to me and I moved up here to Alaska in the Fall of 1999. This place is my home now. I am close to my mother and little sister. Our home Village of Chistochina, AK is very peaceful. Everybody knows everyone else and we are a close knit community, a family. I now labor quietly in Public Safety. I serve in this capacity and will do so to the end of my days upon the earth. As you will see in the following pages, I have armed myself now and you will see some photos of the last few years here in Alaska. Inspite of my failures to fit in amongst my own Church and living that kind of lifestyle of Home & Family; in my heart and mind. I still support the overall teachings of the LDS church. This Church gave me much opportunities and my God did bless me much throughout my life for what good I did for myself and for Others. I believe in the Book of Mormon. It is another testament to the divinity of Jesus Christ. And it does tell me, as a Native, where my ancestors ultimately came from. It supports the Bible in testifying of Jesus Christ. I am not like most Natives, who hate white people. I do not reject white society but rather take the best of both my own proud Lakota heritage and from the white culture around me. I do not question the LDS church or it's teachings. I do not wish to discredit any of the Church leaders or to destroy anyones faith in this Church. My life speaks for itself, in being the good person that I am. In the day to day choices and activities I do, I shape my character and my path throughout the Eternities. May your life also tell people Who you are. Take some pride in who You are, be the best that you can be. You will answer for your choices you made by being punished or rewarded. God bless all of you in this year 2006. theSam!!! in his massage chair. I grew my hair out Long and cut it off Dec 2004. Now I have High & Tight fade.